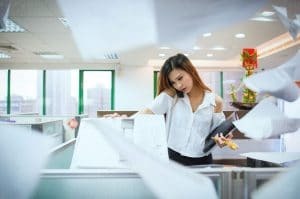 You need to understand how certain aspects of your copier are going to affect your business if you want to make a smart choice. There is no point in getting a tabloid machine if you don’t need large prints. Similarly, you don’t need a printer with extremely fast print times unless you are doing a ton of printing. That’s why you need to understand a variety of things that determine if a copier is a good value of not, and one of the most overlooked ones is the importance of warm-up time. Warm-up time is the time it takes for your printer to get ready to perform its job. In other words it’s how long it takes for your printer to go from being off to producing its first print. Many people don’t consider why this is important and only look at print speed. This can be silly unless your business actually needs fast printing. You need to consider what kind of business you are and what you need. Large operations have greater needs. They also tend to keep their office machines on all day because they are constantly being used. In situations like this the importance of warm-up time dissipates and is replaced by print speed. However, if you are at a smaller business then print speed may be unimportant. If you are only doing a few jobs a day that are relatively small then print speed may not be the most important. This is especially true when you turn your machine off in-between jobs. You don’t want to be waiting and wasting time just for your machine to get ready to print 1 page.